[Unidentified soldier in artillery uniform and Shako hat with Battery K, 1st U.S. Artillery flag and battle honors in front of painted backdrop showing garden leading to river] / S. Anderson, 61 Camp St., New Orleans. 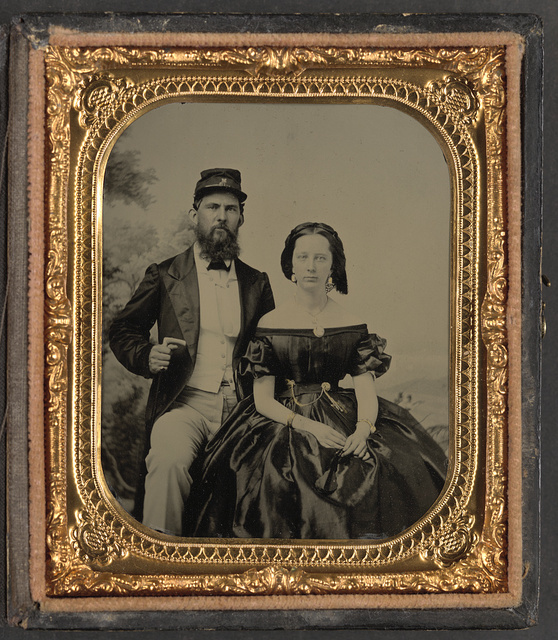 [Unidentified soldier from a Charleston militia unit in kepi with letter "M" and unidentified woman painted backdrop showing trees and a landscape] / Quinby & Co., artists, Charleston, S.C.